I wasn’t lying the other day when I said I’d finally made a new video! Over the weekend I did some editing and it’s ready for your eyes! And only 4 minutes long. If you find it mildly interesting, don’t forget to subscribe! Go, go, go! My BIGGEST Book Haul Ever! When I quit my job at Half Price Books recently I had a tough choice to make. I could either buy all of the books I wanted before my employee discount was no longer valid or I could just forget about them. I of course chose to buy. This is the result. There were so many I couldn’t get them all in the picture for the thumbnail. Ha! Now watch! It’s super quick! February has come and gone, which means even MORE books! But I’ll be honest. I actually got these in January at the same time as my previous book haul. I even recorded it at the same time because I didn’t want to have a million books in one video. So let’s just not get all technical with it. We’ll pretend that I didn’t tell you all of that and that these books were actually bought in February. How’s that? Now watch, watch, watch! And tell me which books you brought home this month. Welp. Please don’t yell at me, okay? I KNOW I’m supposed to be on a book buying ban, but I still had a $50 gift card from last year and we were doing inventory at my store this past week. So I had to either buy my books or put them back on the shelf. I chose to buy. 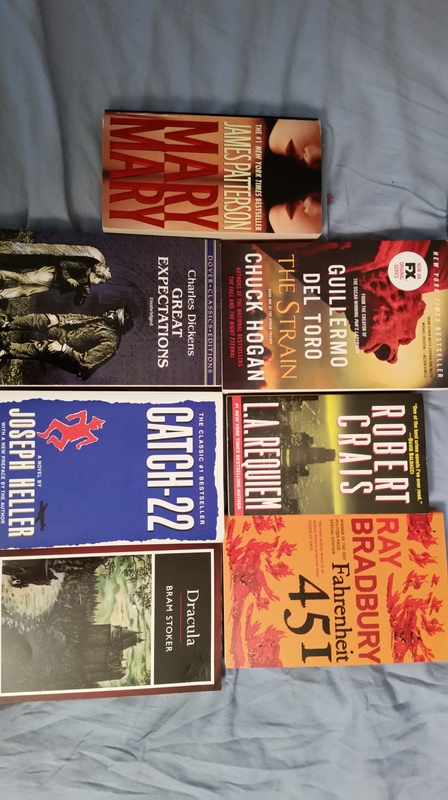 So these are some of the books I bought! All will have videos at some point! Tell me what you think. And tell me which books you’ve recently acquired. Now watch, please. I decided that since July has been a record month in terms of book buying for me, I might as well write a post about all the books I acquired. Except I have that whole YouTube thing going, right? Why not use that instead? I’ve written two posts this month about the books I’ve bought. I combine all the books from those posts into this new video. And give you a little bit of insight into why I bought them that I didn’t do the first time around. For the most part. Also, I won’t have a set schedule to release videos, but whenever I do it’ll always be either a Monday or Thursday. I think. Also, once I hit a specific number of YouTube subscribers I’ll be able to get a custom URL. Can y’all help me with that, please?! Just click here to get to my channel page. I told you guys yesterday about how impressed I was during my first experience at Half Price Books, and I promised to show y’all which books I came away with. It looks like I make good on my promises. Sometimes. Ha. Anyway, I’m just going to show you the books now. Normally when I glance over book haul posts I see long lists of covers and descriptions of the books included. I’m not going to do that because those are almost always ultra popular YA titles that everyone knows about. I’m pretty sure you’ve never even heard of half my books, so no point in me acting like everyone will know them. To the books! I know you can see the titles just fine, but I’ll tell you the book titles anyway. I have two interesting points about these books before I leave you alone for the rest of the day. First, I’ll be making videos for three of these titles. And second, three of the books are actually new! I bet you can’t even tell which ones aren’t. Remember what I said about the books available at Half Price Books? Have you read any of these books? Tell me about the books you’ve added to your collection recently. On this day in 2014 I published Writer’s Privilege is a Real Thing.